I'm uploading another MP3 sample with the Super Distortion clone and P-94 neck in "real life", i.e. from our last gig in Nov 2005. I think it's interesting for this comparison, because I used almost the same gear (LS120 with Boogie and 1x12 EV12L plus Roland Chorus Echo), but the volume was set for a small club with a bit more gain and less presence. Someone with a digicam recorded us and decided to switch it on during ZZ Top's Arrested For Driving While Blind a few bars before the chromatic change from G to D at the end. So there's only ~20 seconds of bridge humbucker action, and the rest is the P-94 set back to approximately 6 on the guitar volume to get a rather clear neck pickup sound. By the way, I use a "treble bleed" cap there (but not on the bridge pickup), so the highs still come through with less overall bass at that setting. Posted: Tue Feb 14, 2006 1:48 pm Post subject: Tokai PAF-Vintage MK2 or Tokai '57 PAF ? In this excellent thread, there are discussions of the Tokai PAF-Vintage MK2 and the Tokai '57 PAF, among others. According to catelog info I have seen, my 1985 LC-60 came with "TOKAI '57 PAF Vintage MKII Pickups" So it kind of sounds (as far as name goes) as a cross between the above two. Would I be correct in guessing that this would be closer to the Tokai '57 PAF rather than the Tokai PAF-Vintage MK2 ? I would think so, because the PAF-Vintage MK2 (or II) is a rather new name and wasn't used in the early to mid '80s, as far as I know. Does your pickup have a black sticker with golden frame like in the picture of my LS120? I just read this entire post for the second time... excellent piece Hans! Great insight and great playing! Hans - I checked the back of the pickups, and the bridge appeared to have once had a sticker of some sort, but all that is left is a small rectangular impression on the back in the wax (?) where the sticker used to be. Seems as if it may have been removed . . . ? The neck pickup didnt have anything, but then it doesnt seem to have the wax all over the back like the bridge pickup does. Any thoughts? The neck pickup didnt have anything, but then it doesnt seem to have the wax all over the back like the bridge pickup does. Any thoughts? My 1984 '57 PAFs with the sticker weren't waxed either, so maybe someone waxed your bridge pickup to prevent microphonic feedback at very high volumes. About the naming: you're right (and I was wrong), Tokai used both parts for a rather long name ('57 PAF Vintage MKII) that I've seen in the meantime in old catalogs, too. So yours is probably the same version that I originally had in my 1984 LS60. The new Tokai bridge pickup that I tested in this comparison was made by Keiyo, not Gotoh, and sometimes has an additional N as the last letter in the name, but e.g. not in the new catalog. If it has a resistance of ~11.5 kOhm, it's the new one though. I thought I should add this here, because I recorded two more clips of Alright Now ("Jeezz..." ) with my LS120, one with the old Schaller M6 tuners that the first owner had installed before I bought it from him in 1985, and one with the new nickel plated Schaller ST6K Kluson copies I got a few days ago from Rockinger in Germany for ? 35.00. As a start some pictures which I found on the web, the first one is from Rockinger's site, but mine look exactly like the picture from Audiofanzine, i.e. they are a little bit "aged" to a faint green, but not as much as the greenish tuners on some of the MIK Tokai Love Rocks. 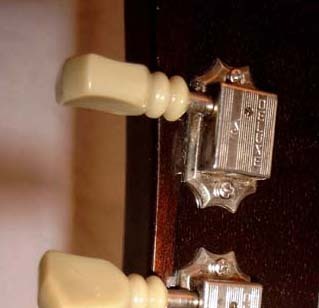 So one reason for buying the Kluson copies was that those ugly screw holes in the back would be used again, although it now has the holes from the M6 tuners of course, but they don't look as mean... Furthermore I always liked Kluson tuners better than any metal types, and the double rings are a nice bonus, too. And it was important that the new Schallers were made for 10mm shafts as well, since the first owner had to manually widen the boreholes with a file. The ST6K have a 16:1 gear ratio while the M6 use 14:1, so they offer a smoother and more controlled feeling when tuning the strings with harmonic overtones. They also feel great, not like plastic at all and as if they had been installed since 1981, i.e. with a "well-known" grip. But the main reason for changing the tuners was that I was curious if and how their much smaller weight would influence the sound of the guitar. I needed a new set of tuners for my Luxor 335 copy anyhow, so there was no risk of wasting any money. The ST6K have a weight of 180g while the M6 weigh 260g, so that's almost 50% less which is already noticable when picking up the guitar or moving it around while holding it. I used slightly different settings on my Boogie, because I had changed the power tubes to NOS Philips/Sylvania (blue label) in the meantime which sound fuller and smoother than the Russian 6L6 copies I used during the pickup comparison. The Thiele cab with EVM-12L speaker was connected to the "correct" 8 ohm output as well, not to the 4 ohm jack as before. Volume 1 was on 7 this time, Treble and Middle on 7, Bass on 3, Lead Drive on 6, Lead Master on ~0.8 and Presence on 4. The omnidirectional mic had the same position pointing towards the ceiling. I didn't change anything between the two recordings, but waited one day for the guitar to recover from the total release of tension. In my experience it always takes at least a few hours for any guitar to sound similar after changing all strings etc. A small problem occured with the recording of the new tuners, because the guitar was louder than before, so it distorted the line input channel a little bit, since the first recording was leveled with not much headroom. I decided to leave the spikes in there and not use another recording with a lower input setting, because that would alter the sound too much, and you wouldn't know what the cause for the difference was. Don't you think that the "slighly different setup" with new tubes caused the new loudness of the guitar ??? ... or you have got a tonal change by a difference in rewinding the strings at the tuners ... did you do it in the same mannor you've used to do it all the time ??? How do you get quality music through your microphone in voice chat? I want to play music through voice chat on team fortress 2, but when i play it normally through the microphone, it sounds really crappy. All the time i see people on voice chat that play music and it sounds great. How do i do that? What you do is you start a new thread in an appropriate section - not Announcements. Posted: Wed Dec 07, 2011 4:18 pm Post subject: "That lil' ol' ZZ Top cover band from Hamburg..."
Hi, long time no see. I just tried to restore this thread by uploading the soundfiles and images to my new homepage. I think I got the links right except for one soundfile missing, the Super Distortion clone with the bass line which disappeared from my computers somehow during the last 10 years.